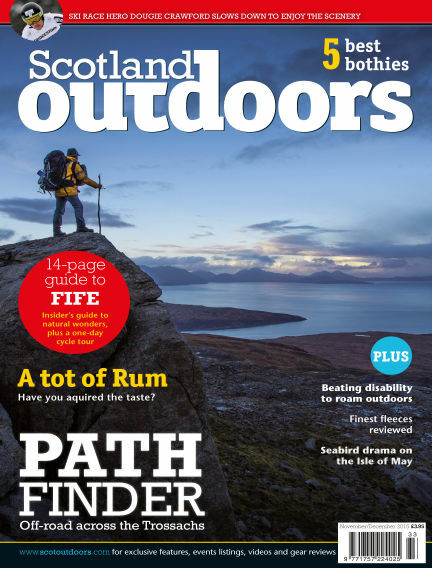 In this issue of Scotland Outdoors : Scotland Outdoors highlights the very best of Scotland’s natural diversity from its dramatic coastline to the high tops of its iconic peaks. From north to south and across the many islands that decorate its fringes, Scotland’s landscape is both alluring and challenging. We want to help you explore it. Of course, it is important to recognise that our actions have consequences and so we understand the need to tread lightly. We don’t want to preach – after all, none of us are perfect – but our emphasis will always be on sustainable, low-impact use of wild places. With Readly you can read Scotland Outdoors (issue Nov - Dec 2015) and thousands of other magazines on your tablet and smartphone. Get access to all with just one subscription. New releases and back issues – all included.